Good morning, my peeps! And yes, I'm referring to the sugar-covered marshmallows in the shape of a baby chick. And good morning to the rest of you humanoids as well. January is FINALLY over, which means that it's one step closer to t-shirt weather. It's also a VERY busy wedding booking season for Amy and me, with SEVENTEEN weddings for 2016 booked, and three for 2017! 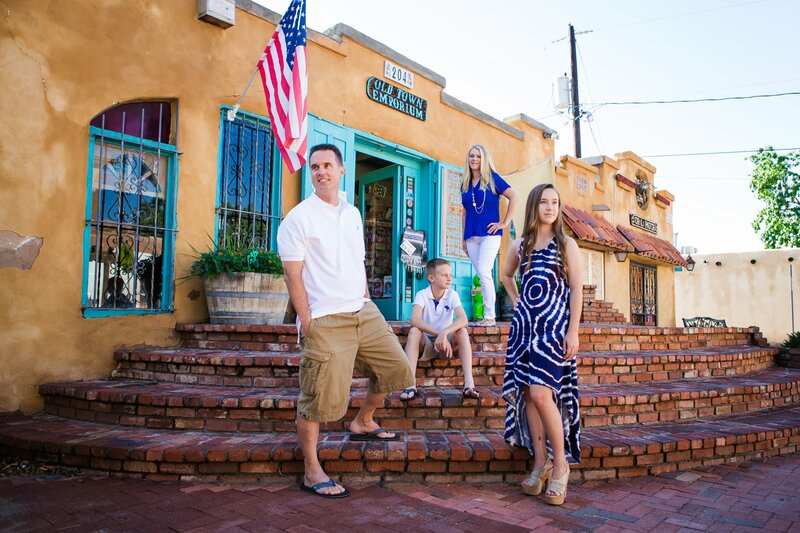 So while I'm over here mentally indulging in my personal fantasy of wearing sandals and shorts in 80-degree weather, I'll also get to the heart of today's blog: Old Town Plaza. 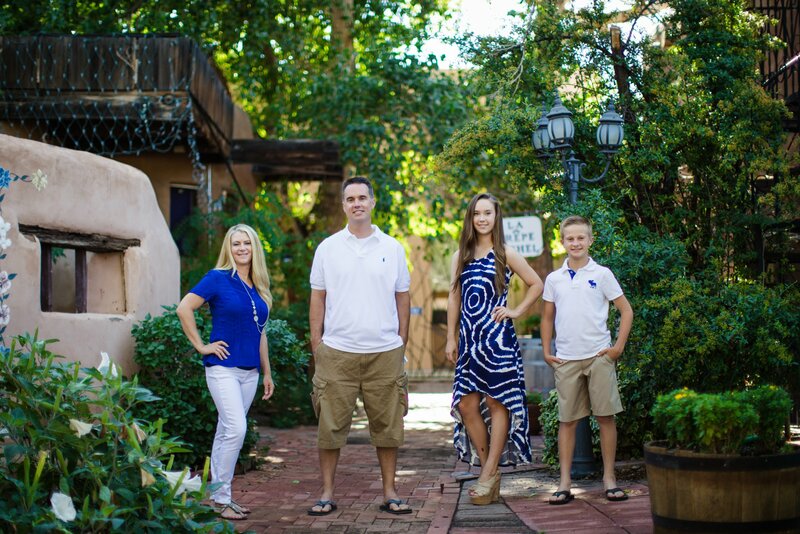 Continuing with my "Location Spotlight" series, highlighting my favorite locations to do family and engagement photos, we'll talk about a location with real New Mexico flavor, being fully "New Mexico True," as it were. 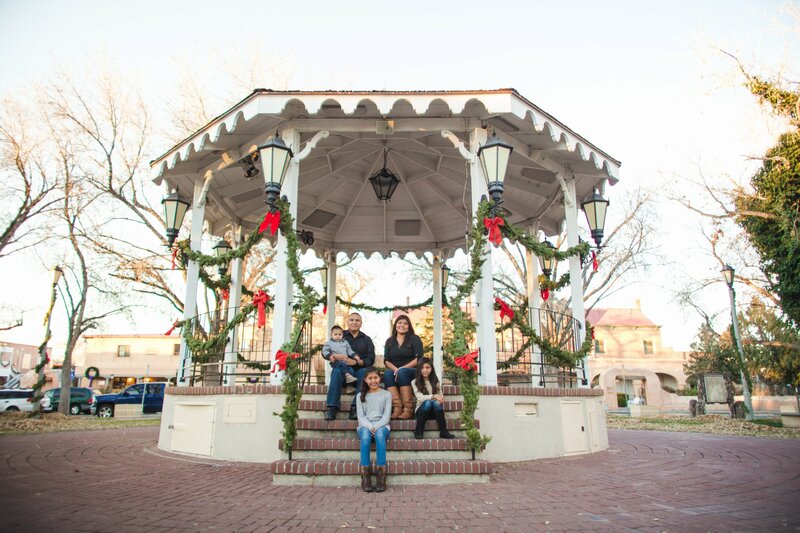 Within the last year or so, the plaza in Old Town, founded in 1706, has quite unexpectedly become one of my favorite places to do family and engagement photos. 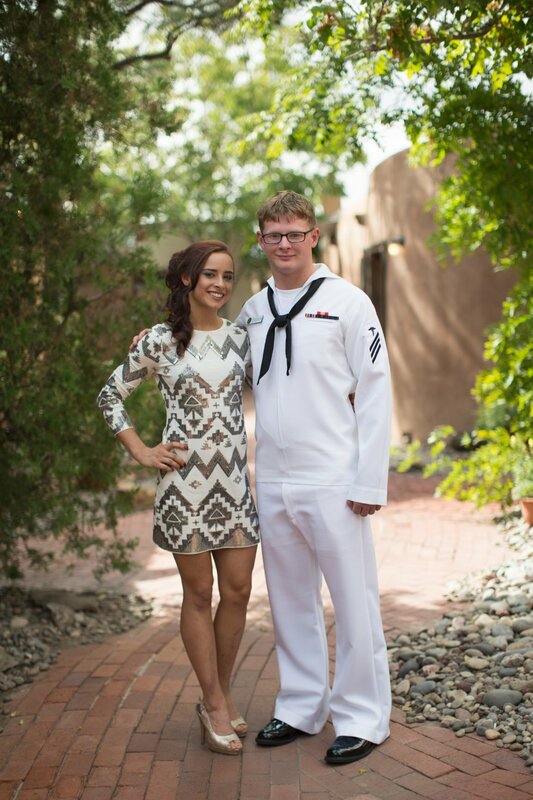 For those of us that were born and raised here in New Mexico, we love authenticity and we love our culture. We're proud of our Balloon Fiesta, our red & green chile, Breaking Bad, our unique linguistic style, and for some of us, our Zia tattoos. 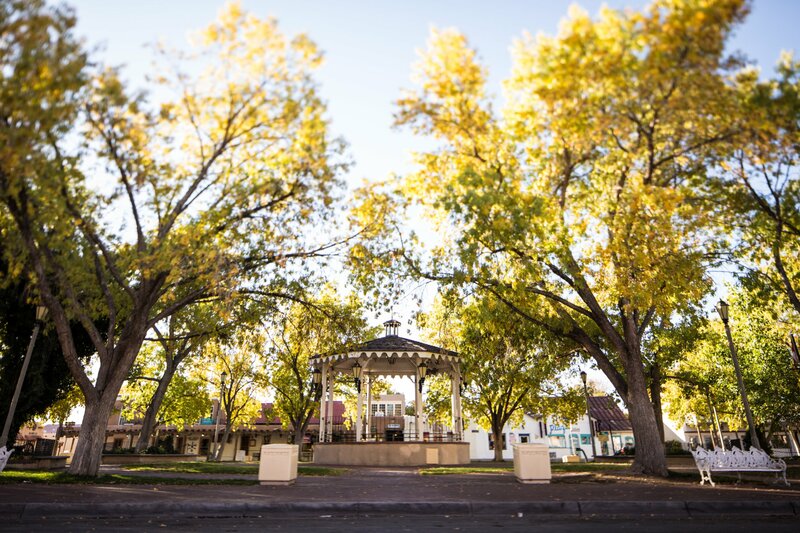 With Old Town being such a tourist hot spot, we can sometimes forget that this plaza, being the original heart of Albuquerque, isn't necessarily all turquoise, Breaking Bad merchandise, and Dia De Los Muertos knick-knacks. Although the plaza is mostly storefronts, there are still a lot of gems tucked away that make for wonderful backdrops when isolated. Let's start with this personal favorite I like to use at all times of the year, and especially during Christmas time. This entry gate, located between Covered Wagon and Plaza Gifts, is an unexpected hideaway in plain sight. Always lined with bright red ristras, it's enough color to bring out a festive mood in any photograph. If it's a more floral pattern you're looking for, the painted stairway over by Gabby's Handmade Soaps may be right up your alley. 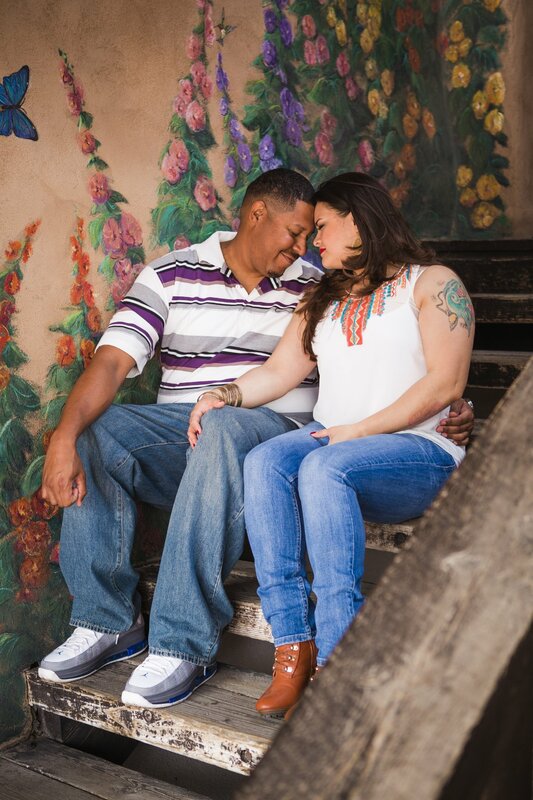 This stairway is great for engagement sessions or for sessions with smaller children, and even works well for portraits with a colorfully blurred background. But if you're looking for that old wooden feel without all the bright colors, you can photograph about ten paces away right next to Native Gold. Stairs are everywhere in Old Town. You'll see them anywhere from the plaza gazebo, to the brick stair entryway at Old Town Emporium. 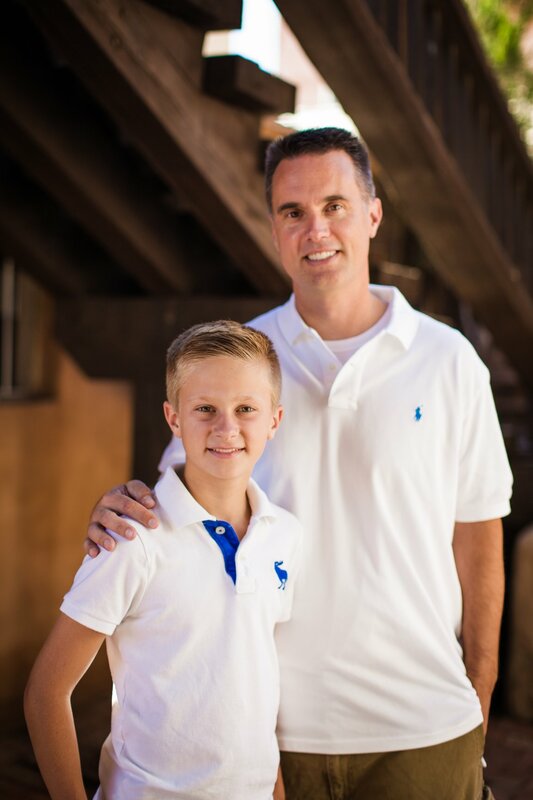 For family members of differing heights, it can be enough to add that extra bit of drama to your photos. Along with stairs, Old Town is ripe with brightly colored windows and doors. If a full door is too much color for you, there are still smaller windows and accents to give you just enough color in your photos. 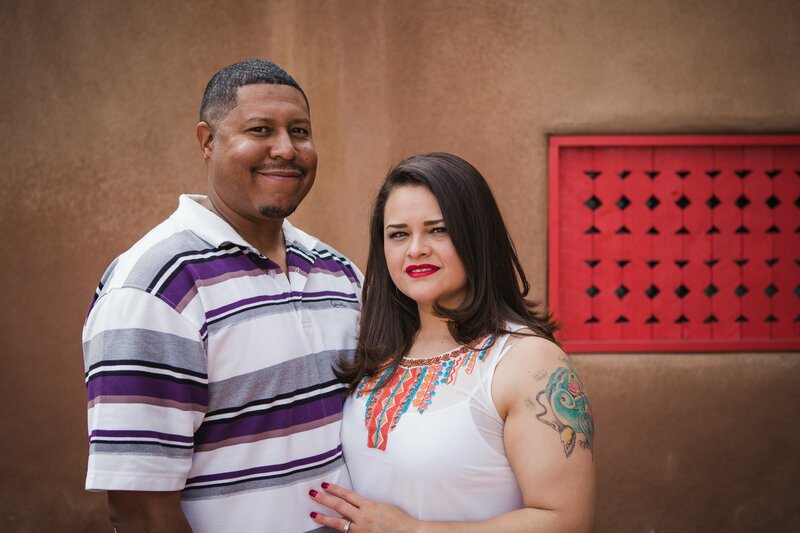 The warm adobe walls and smaller red accents are great for bringing out skin tones and lipstick. Even if all you need is a subtle park bench, Old Town has those too! Poco Apoco, or Nick's Patio, also provides a beautiful backdrop, bringing out my subjects without being too distracting. ...and all the white posts are striped like candy canes. 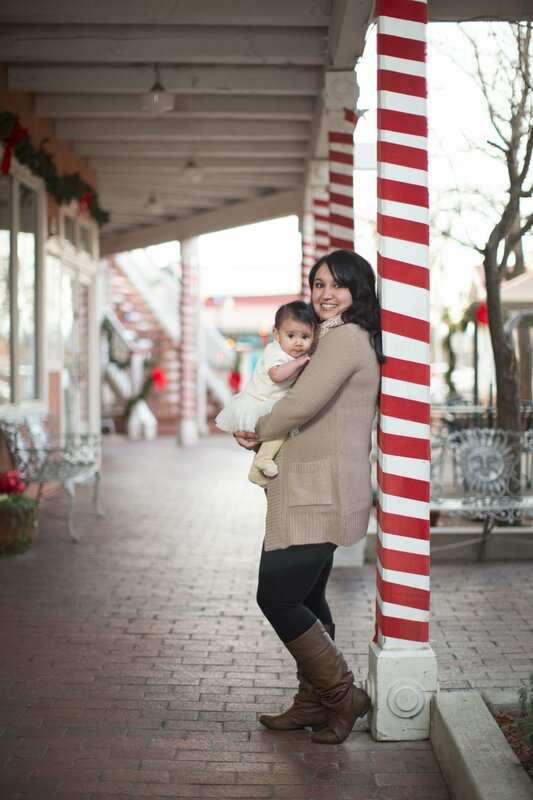 A perfect location to do holiday photos for your Christmas cards! And don't forget that gazebo! A last favorite spot of mine is located on the northern end of the plaza, at Patio San Felipe Del Norte. While not as bustling as the main square, this beautiful patio is lined with flags, making any photo unique. Tucked further back is La Crêpe Michel, which is completely surrounded by lush greenery from April to October. The quiet mornings there on the patio are to die for. 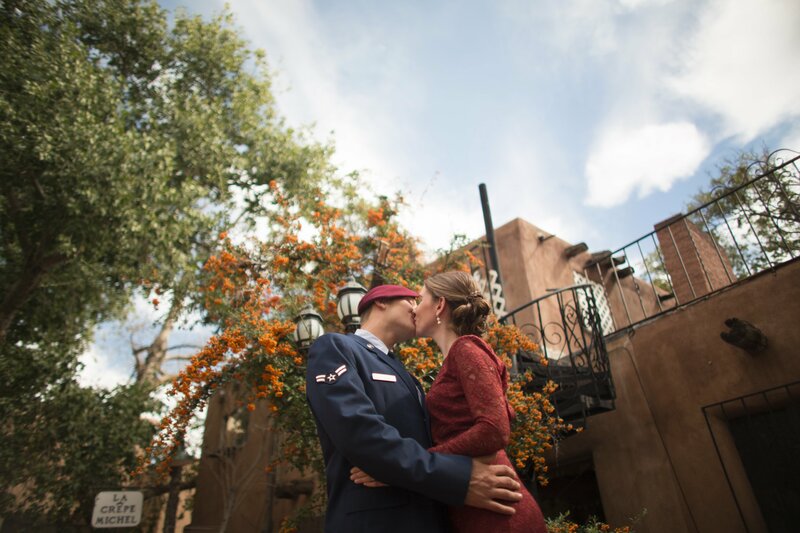 Even the pueblo style architectire will add that extra bit of Albuquerque flavor to engagement photos! Last, but certainly not least, is the San Felipe De Niri chapel, located in the heart of the plaza, towering like a watchful eye over the town square. 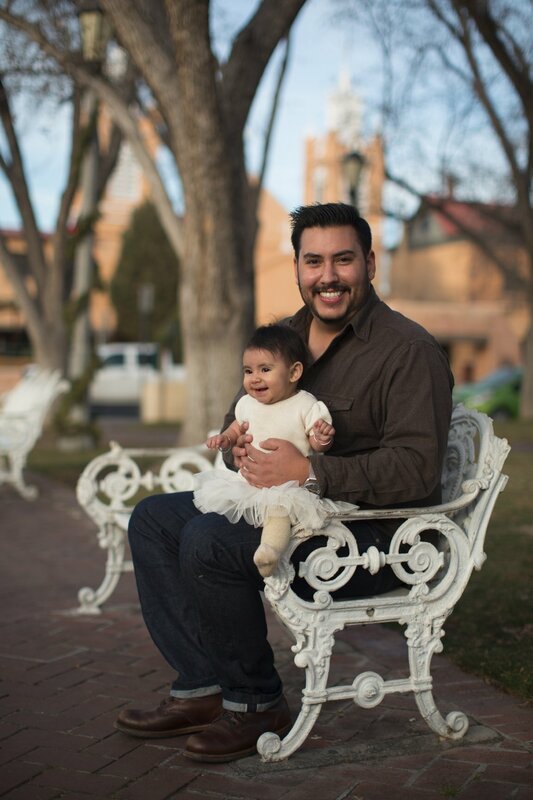 Albuquerque has a rich Catholic history which is pervasive in the local culture, fashion, and architecture. 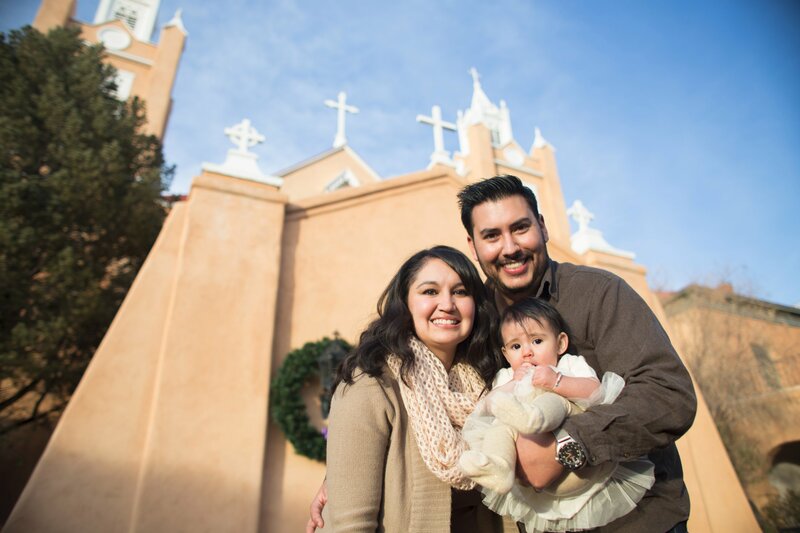 For families or couples of that particular religious affiliation, or even if you can fully appreciate the architecture as I do, having this one-of-a-kind Albuquerque landmark as a backdrop is a perfect addition to your photos. 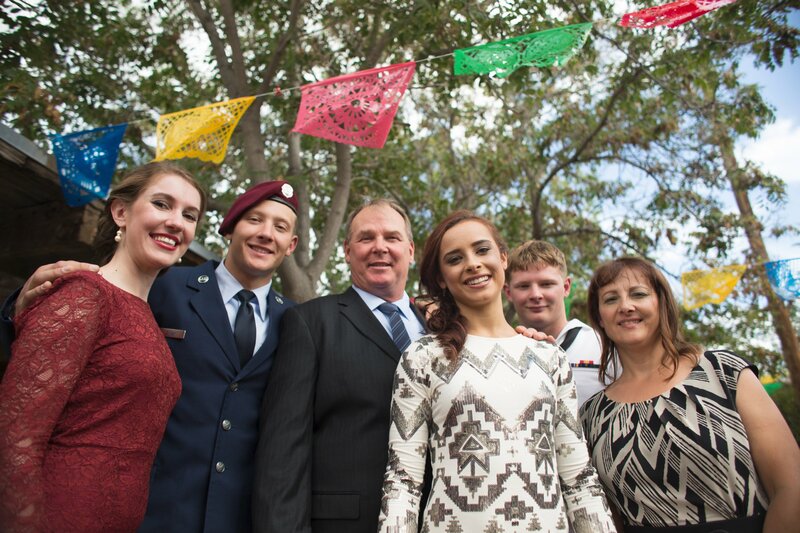 We New Mexicans take a lot of pride in our state, in our culture, and in our identity. 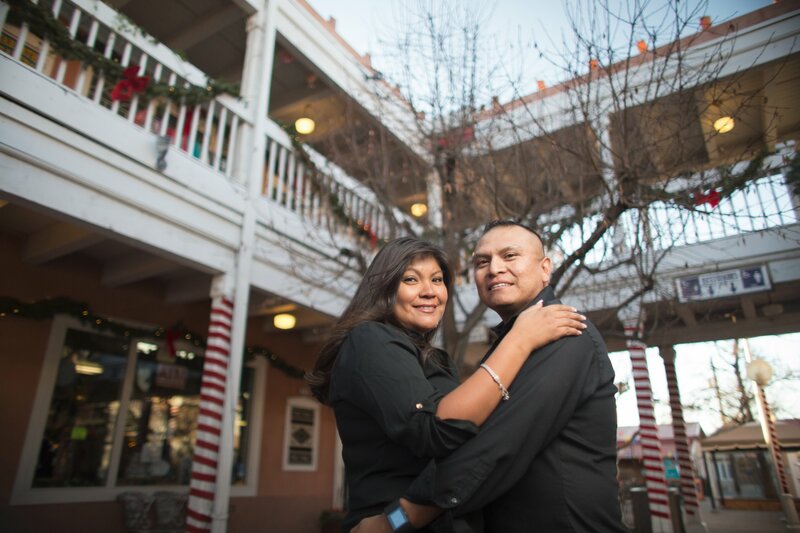 When it comes to a photo session location that is 100% authentic Albuquerque all year 'round, Old Town is my number one go-to spot. That's it for today, folks! Have a wonderful February, and take care of each other.